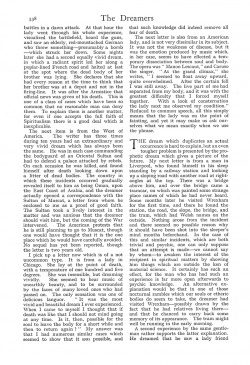 The Dreamers: Notes from a Strange Mail-bag is an article written by Arthur Conan Doyle published in The Strand Magazine in june 1928. 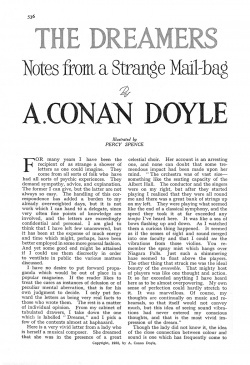 Conan Doyle tells the stories of dreams sent to him by mail from various persons. She saw an elderly German who threw something — presumably a bomb — which struck her down. Suddenly a huge man appeared before him, holding a triangular dagger of peculiar shape with which he made the motion of striking. Getting no answer, he touched him. 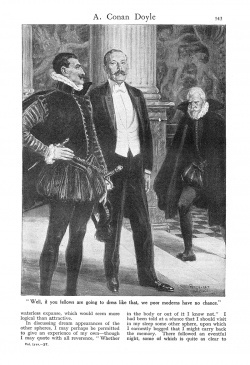 "Well, if you fellows are going to dress like that, we poor moderns have no chance." For many years I have been the recipient of as strange a shower of letters as one could imagine. They come from all sorts of folk who have had all sorts of psychic experiences. They demand sympathy, advice, and explanation. The former I can give, but the latter are not always so easy. The handling of this correspondence has added a burden to my already overweighted days, but it is not work which I can hand to a delegate, since very often fine points of knowledge are involved, and the letters are exceedingly confidential and personal. I am glad to think that I have left few unanswered, but it has been at the expense of much energy and time which might, perhaps, have been better employ. in some more general fashion. And yet some good end might be attained if I could use them discreetly in order to ventilate in public the various matters discussed. I have no desire to put forward propaganda which would be out of place in a popular magazine. If the reader likes to treat the cases as instances of delusion or of peculiar mental aberration, that is for his own judgment to decide. I only put forward the letters as being very real facts to those who wrote them. The rest is a matter of individual opinion. From my cabinet of tabulated drawers, I take down the one which is labelled "Dreams," and I pick a few of the contents almost at haphazard. Here is a very vivid letter from a lady who is herself a musical composer. She dreamed that she was in the presence of a great celestial choir. Her account is an arresting one, and none can doubt that some tremendous impact had been made upon her mind. "The orchestra was of vast size — something like the seating capacity of the Albert Hall. The conductor and the singers were on my right, but after they started playing I realized that they were all round me and there was a great bank of strings up on my left. They were playing what seemed like the end of a classical symphony, and the speed they took it at far exceeded any tempo I've heard here. It was like a sea of bows flashing up and down. As I watched them a curious thing happened. It seemed as if the senses of sight and sound merged into one faculty and that I could see the vibrations from those violins. You remember the spray mist which hangs over Niagara Falls. Just such it shimmering haze seem. to float above the players. The other thing that struck me was the ideal beauty of the ensemble. That mighty host of players was like one thought and action. It so far exceeded anything I have heard here as to be almost overpowering. My own sense of perfection could hardly stretch to it. It was marvellous. Of course, my thoughts are continually on music and rehearsals, so that itself would not convey much, but this idea of seeing sound vibrations had never entered my conscious thoughts, and that is the most vivid impression of the dream." Though the lady did not know it, the idea of the close connection between colour and sound is one which has frequently come to us in what purported to be descriptions of life in the beyond. I could very readily find a dozen illustrations of the fact among those posthumous accounts which profess to describe the experiences which await us. The general idea of concerted music is also very familiar. "I play in an orchestra and I enjoy it so much." Such was a message which I received myself recently from a friend who was fond of music. Lester Coltman, the Guardsman, in what is asserted to be his after-death experience, says, "Orchestration is my great hobby here." And adds, "For some time after I passed over I was undecided as to whether music or science should be my work. After much serious thought I determined that music should be my hobby, and my more earnest intent should be directed upon science in every form." It may be said, generally, that the evidence of psychic research agrees with the vague Christian tradition that music plays a large part in the higher spheres. The next letter which I pick up deals with a very much less elevated impression. This is an American, writing from San Jose, California, who dreams names. "If I can identify the name with some race-horse I have found that the horse has, nine times out of ten, won the race. I am not inter.ed in horse-racing and have not been on a track for twenty years." The next letter is also about horse-racing from is retired captain in Ireland. In his case he claims to get a picture, not a name. He is not a betting man and makes no use of his information, which is just as well for the bookies. Going over his results, I find that he seldom got a winner, but that his horses were invariably placed. It was a curious dumb-crambo system of conveying names, when supplied by vision, but occasionally they came in an audible voice at the moment of waking from sleep. What are we to make of such an experience? Is it imagination followed by coincidence? Or is it of some humble psychic origin? We have to place on the other side the many cases where such dreams have betrayed us. Only last year I had the experience of backing the dream of a friend for the Derby, and being five pounds poorer as a consequence. 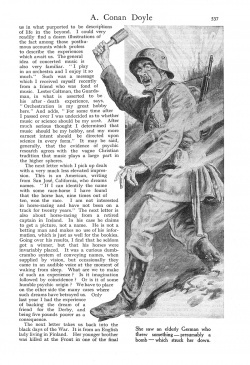 The next letter takes us back into the black days of the War. It is from an English lady living in Finland. Her younger brother was killed at the Front one of the final battles in a dawn attack. At that hour the lady went through his whole experience, visualized the battlefield, heard the guns, and saw an elderly, red-moustached German who threw something — presumably a bomb — which struck her down. Some nights later she had a second equally vivid dream, in which it radiant spirit led her along it poplar-lined French road and halted at last at the spot where the dead body of her brother was lying. She declares that she had every reason at the time to think that her brother was at a depot and not in the firing-line. It was after the Armistice that official news was given of his death. This is one of a class of cases which have been so common that no reasonable man can deny them. To explain them is another matter, for even if one accepts the full faith of Spiritualism there is a good deal which is inexplicable. The next item is from the West of America. The writer has three times during ten years had an extraordinary and very vivid dream which has always been the same. He was in each case commanding the bodyguard of an Oriental Sultan and had to defend a palace attacked by rebels. On each occasion he was killed, and found himself after death looking. down upon a litter of dead bodies. The country in which these incidents occurred gradually revealed itself to him as being Oman, upon the East Coast of Arabia, and the dreamer actually opened a correspondence with the Sultan of Muscat, a letter from whom he enclosed to me as it proof of good faith. The Sultan took it lively interest in the matter and was anxious that the dreamer should visit him, but the coming of the War intervened. The American protests that he is still planning to go to Muscat, though one would have thought that it is the one place which he would have carefully avoided. No sequel has yet been reported, though the letter is two years old. I pick up it letter now which is of it not uncommon type. It is from it lady in Chicago. She lay at the point of death, with a temperature of one hundred and five degrees. She was insensible, but dreaming vividly. She seemed to hear music of unearthly beauty, and to be surrounded by the faces of many loved ones who- had passed on. The only sensation was one of delicious languor. "It was the most vivid and beautiful dream I ever experienced. When I came to myself I thought that if death was like that I should not mind going at any time. Is it, then, possible for the soul to leave the body for it short while and then to return again?" My answer was that I had numerous similar cases which seemed to show that it was possible, and that such knowledge did indeed remove all fear of death. The next letter is also from an American lady, and is not very dissimilar in its subject. It was not the weakness of disease, but it was the emotion produced by music which, in her case, seems to have effected a temporary dissociation between soul and body. The opera was "Manon Lescaut," and Caruso the singer. "At the grand climax," she writes, "I seemed to float away upward, quite overwhelmed. After the curtain fell I was still away. The live part of me had separated from my body, and it was with the greatest difficulty that I forced myself together. 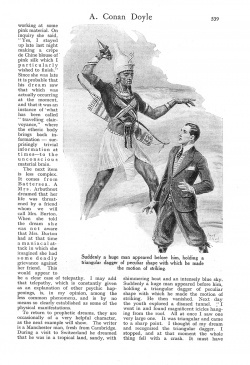 With a look of consternation the lady next rile observed my condition." Reduced to common speech, all this simply means that the lady was on the point of fainting, and yet it may make us ask ourselves what we mean exactly when we use the phrase. The dream which duplicates an actual occurrence is hard. to explain, but an even tougher is presented picture by the prophetic dream which gives a picture of the future. My next letter is from a man in Liverpool, who found himself in his sleep standing by it railway station and looking up a sloping road with another road at right-angles at the top. There was it bridge above him, and over the bridge came a tramcar, on which was painted some strange place names of which he had never heard. Some months later he visited Wrexham for the first time, and there he found the station, the road, the slope, the bridge, and the tram, which had Welsh names on the outside. Nothing arose from the incident and there seemed no possible reason why it should have been shot into the sleeper's mind months beforehand. In the case of this and similar incidents, which are both trivial and psychic, one can only suppose that an attempt is made — we cannot say by whom — to awaken the interest of the recipient in spiritual matters by showing him things which are outside the ken of material science. It certainly has such an effect, for the man who has had such an experience is far more open afterwards to psychic knowledge. An alternative explanation would be that in one of those nocturnal rambles which our souls or etheric bodies do seem to take, the dreamer had visited Wrexham — possibly drawn by the fact that he had relatives living there — and that he chanced to carry back some memory of its appearance. The tram might well be running in the early morning. working at some pink material. On inquiry she said, "Yes, I stayed up late last night making a crêpe de Chine blouse of pink silk which I particularly wished to finish." 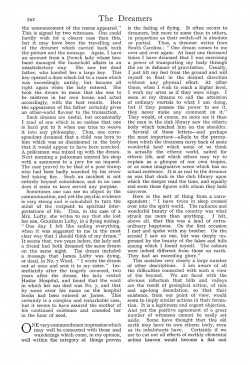 Since she was late it is probable that his dream saw that which was actually occurring at the moment, and that it was an instance of what has been called travelling "clairvoyance," where the etheric body brings back information — surprisingly trivial information at times — to the unconscious material brain. The next item is less complex. It comes from Battersea. A Mrs. Arbuthnot dreamed that her life was threatened by a friend whom we will call Mrs. Burton. When she told the dream she was not aware that Mrs. Burton had at that time a maniacal attack in which she imagined she had some deadly grievance against her friend. This would appear to be a clear case of telepathy. I may add that telepathy, which is constantly given as an explanation of other psychic happenings, is, in my opinion, among the less common phenomena, and is by no means so clearly established as some of the. physical manifestations. To return to prophetic dreams, they are occasionally of a very helpful character, as the next example will show. The writer is a Manchester man, fresh from Cambridge. During a visit to Switzerland he dreamed that he was in a tropical land, sandy, with shimmering heat and an intensely blue sky. Suddenly a huge man appeared before him, holding a triangular dagger of peculiar shape with which he made the motion of striking. He then vanished. Next day the youth explored a disused tunnel. "I went in and found magnificent icicles hanging from the roof. All at once I saw one very large one. It was triangular and came to a sharp point. I thought of my dream and recognized the triangular dagger. I stopped, and at that moment the whole thing fell with a crash. It must have weighed at least two hundred pounds, and would, perhaps, have killed me." What are we to make of this? Is it not beyond coincidence? And how are we to explain the tropical scene? I would only suggest — but with all reserve — that many of us believe that we have guides or guardian angels. These guides would appear to be often drawn from the Oriental races. 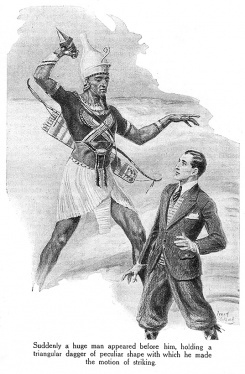 Supposing that this youth's guide was an Egyptian, he might in warning his pupil have brought back with him some impression of his native land. The student remarked that the dagger was of a shape which was once used in Ancient Egypt. Such an explanation may stand until a better one is found. A number of these dreams are concerned with objects which have been lost and found again by revelation. There is always the consideration that such finds may have been the result of some subconscious train of thought, as occurs so often in our everyday experience when the solution of some problem wells suddenly up from the unknown depths of our mentality. But in some cases this would seem to be impossible. Here, for example, is a letter from Bath. The writer was a solicitor in a South African city. He had a client to whose father in early days a grant of land had been made in the outskirts of the city. At the time it was of no value, but as the city spread it became so, but very many years had passed and the grant was lost. One night the client dreamed where it was. 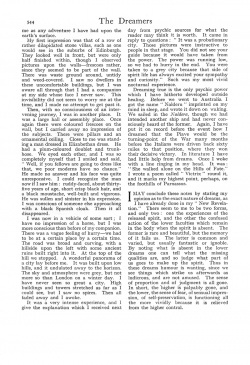 Next day, accompanied by a resident who knew the town well, he walked to the place of his dream, identified a certain cottage, had his knock answered by a, lady whom he had seen in his sleep, walked through to an outhouse, opened an old box, and plucked out the grant, which had been stuffed into an envelope tacked to the inside of the lid. It is sad to relate that after all this trouble the grant was not admitted by the new generation of officials. But the story, told as it is by the solicitor concerned, seems to be incontrovertible. What are we to make of it? Here, again, we seem to be balanced between the possibilities of the wandering soul and those of external intelligence. In any case such incidents deserve our best consideration, and our men of science may well turn their minds from the insects and the stones in order to unravel problems so intimately related to our own nature and fate. The next letter happens to be from the same quarter and on a similar subject. It tells the tale of a Muizenberg lady who lost her box, and had successive lady who it for several months during its various and devious wanderings, until she at last saw it in her sleep reposing upon the shelf of the Lost Property Office, whence she duly reclaimed it next morning. When we read such an account we feel a certain sense of injury as we survey our own losses, and we wonder why we also should not all have such help. Here we must admit that we are on the edge of the unknown. The wireless message comes sharp and clear when we tune into the exact vibration. A fraction above or below, and it is gone. Here, too, there may be unconscious tuning-in of the receiver. But what is the transmitter? That is the next great problem which faces humanity. It is clear that to find the right receiver is difficult, otherwise messages would not be sent in so indirect a fashion. The next example illustrates what I mean. A London lady gets a message, or rather a vision, which assures her that an unknown woman who is embracing two children is about to "go on her last journey — her last, long, strange journey." The actual message and the name, Mrs. Lorimer, came audibly. On inquiry, the dreamer found that there was such a woman, that she had two children, and subsequently that she died. We may well deduce that if the receptive power were a common one the message would certainly have been given more directly, and not in a way which was it distant that it might well have miscarried. I have spoken of the night travels of I the etheric body. I come now to a very remarkable example of it — unique, so far as I know, because the return to the material body was slow and clearly remembered. The gentleman who writes to me — a Manchester man-fell asleep before his fire. He woke up, still seated in a chair, in the early morning and glanced at the clock. It marked twelve-fifteen, but it was not his clock. With amazed eyes he looked along the mantelpiece. Everything was strange. There were two big bronzes of equestrian figures. The mantelpiece itself was of heavy red marble. The fire-irons were of massive brass. He was so petrified that it was a long time before he could bring himself to look round. When at last he cautiously turned his head, he found himself in a large room lined with books. 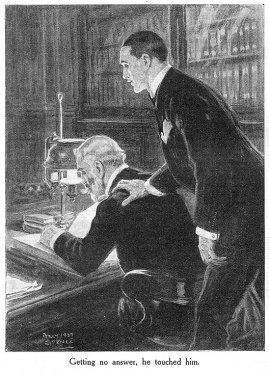 There was a reading-lamp on a long central table, and a man was seated at it. My correspondent was filled with the idea that he had wandered into some stranger's house, so, with an effort, he rose and addressed the man at the table. Getting no answer, he touched him. 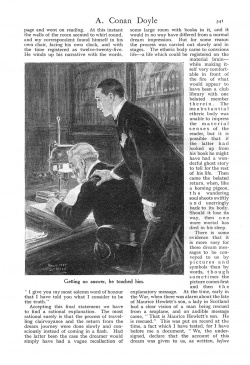 As the man took no notice and remained very still the writer was speculating whether he was dead, when he suddenly turned the page and went on reading. At this instant the walls of the room seemed to whirl round, and my correspondent found himself in his own chair, facing his own clock, and with the time registered as twelve-twenty-five. He winds up his narrative with the words. "I give you my most solemn word of honour that I have told you what I consider to be the truth." Accepting this final statement we have to find a rational explanation. The most rational surely is that the process of travelling clairvoyance and the return from the dream journey were done slowly and consciously instead of coming in a flash. Had the latter been the case the dreamer would simply have had a vague recollection of some large room with books in it, and it would in no way have differed from a normal dream impression. But for some reason the process was carried out slowly and in stages. The etheric body came to conscious life — a life which could be registered on the material brain — while making itself very comfortable in front of the fire of what would appear to have been a club library with one belated member therein. The insubstantial etheric body was unable to impress the material senses of the reader, but it is possible that if the latter had looked up from his book he might have had a wonderful ghost story to tell for the rest of his life. Then came the belated return, when, like a homing pigeon, the wandering soul shoots swiftly and unerringly back to its body. Should it lose its way, then one more mortal has died in his sleep. There is some evidence that it is more easy for these dream messages to be conveyed to us by pictures and symbols than by words, though sometimes the picture comes first and then the explanatory message. At the time, early in the War, when there was alarm about the fate of Maurice Hewlett's son, a lady in Scotland had a clear vision of a man being rescued from a seaplane, and an audible message came, "That is Maurice Hewlett's son. He is rescued." This was put on record at the time, a fact which I have tested, for I have before me a document, "We, the under-signed, declare that the account of this dream was given to us, as written, before the announcement of the rescue appeared." This is signed by two witness. One could hardly wish for a clearer case than this, but it may have been the travelling soul of the dreamer which carried back both the picture and the message. Again, I have an account from a French lady whose husband managed the household affairs in an unsatisfactory way. She saw her dead father, who handed her a large key. This key opened a door which led to a room which was exceedingly untidy, but became all right again when the lady entered. She took the dream to mean that she was to be mistress in her own house, and acted accordingly, with the best results. Here the appearance of the father certainly gives an other-world flavour to the transaction. Such dreams are useful, but occasionally I read of one which is so useless that one is hard put to it when one tries to weave it into any philosophy. Thus, one correspondent dreamed that a child was born to him which was discoloured in the body that it would appear to have been scorched. A policeman was mixed up with the dream. Next morning a policeman entered his shop with a summons to a jury for an inquest. The case proved to be that of a poor tramp who had been badly scorched by his straw bed taking fire. Such an incident is not entirely beyond coincidence, and in no case does it seem to have served any purpose. Sometimes one can see no object in the communication, and yet the psychic evidence is very strong and is calculated to turn the mind of the recipient to spiritual interpretations of life. Thus, in the case of a Mrs. Lofty, she writes to say that she lost her son, Grantham Lofty, in a flying mishap. "One day I felt like ending everything, when it was suggested to me in the most clear way that I should think of my dream." It seems that, two years before, the lady and a friend had both dreamed the same dream on the same night. The dream included a message that James Lofty was dying, or dead, in No. 7 Ward. "I wrote the dream out at once and sent it to my sister." Immediately after the tragedy occured, two years after the dream, the lady visited Haslar Hospital, and found that the ward in which her son died was No. 7, and that by some error his name on the hospital books had been entered as James. This certainly is a complex and remarkable case, but it seems to have assured the mother of his continued existence and consoled her in the hour of need. One very common dream impression which may well be connected with those soul wanderings which come, in my opinion, well within the category of things proven is the feeling of flying. It often occurs to dreamers, but more to some than to others, in proportion as their switch-off is absolute or partial. Thus, a dreamer writes from South Carolina: "One dream comes to me over and over again. At least one thousand times I have dreamed that I was exercising a power of transporting my body through the air in defiance of gravitation. Usually, I just lift my feet from the ground and will myself to float in the desired direction without any physical effort. At ether times, when I wish to reach a higher level, I work my arms as if they were wings. I seem in my dreams to call the attention of ordinary mortals to what I am doing, but if they possess the power to see it, they never make any comment on it." They would, of course, no more see it than the man in the club library saw the etheric body which touched him on the shoulder. 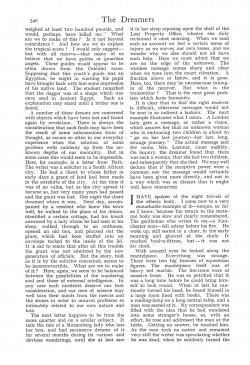 Several of these letters — and perhaps the most important — allude to the perceptions which the dreamers carry back of some wonderful land which some of us think is actually the etheric world, suited for etheric life, and which others may try to explain as a glimpse of our own tropics, or as some imaginative scene which has no actual existence. It is as real to the dreamer as was that clock in the club library upon which the sleeper read the time, and equally real seem those figures with whom they hold converse. Here is the sort of thing from a correspondent: "I have twice in sleep crossed over into the spirit world. The radiance and wonderful beauty of the country was what struck me more than anything. I felt, above all, that this was a land of extraordinary happiness. On the first occasion I met and spoke with my brother. On the second I saw no one, but was deeply impressed by the beauty of the lakes and hills myself. The colours were indeed different from those on earth. They had an exceeding glory." This matches very closely a large number of other descriptions. I am aware of all the difficulties connected with such a view of the beyond. We are faced with the obvious reflection that hills and valleys are the result of geological action, of rain and age-long denudation, to that their existence, from our point of view, would seem to imply similar actions in their formation. It is a legitimate and cogent objection. And yet the positive agreement of a great number of witnesses cannot be easily set aside. Some have thought that this old earth may have its own etheric body, even as its inhabitants have. Certainly if we are to cut out all effects of earthly elemental action heaven would become a fiat and waterless expanse, which would seem more logical than attractive. In discussing dream appearances of the other spheres, I may perhaps be permitted to give an experience of my own — though I may quote with all reverence, "Whether in the body or out of it I know not." I had been told at a seance that I should visit in my sleep some other sphere, upon which I earnestly begged that I might carry back the memory. There followed an eventful night, some of which is quite as clear to me as any adventure I have had upon the earth's surface. My first impression was that of a row of rather dilapidated stone villas, such as one would see in the suburbs of Edinburgh. They looked well in front, but were only half finished within, though I observed pictures upon the walls-frescoes rather, since they seemed to be part of the wall. There was waste ground around, untidy and weed-covered. I saw no dwellers in these uncomfortable buildings, but I was aware all through that I had a companion at my side whose face I never saw. This invisibility did not seem to worry me at the time, and I made no attempt to get past it. Then, with no consciousness of an intervening journey, I was in another place. It was a large hall or assembly place. Once again there were coloured frescoes on the wall, but I carried away no impression of the subjects. There were pillars and an ornamental ceiling. Close to me was standing a man dressed in Elizabethan dress. He had a plum-coloured doublet and trunk-hose. We eyed each other, and I was so completely myself that I smiled and said, "Well, if you fellows are going to dress like that, we poor moderns have no chance." He made no answer and his face was quite unresponsive. 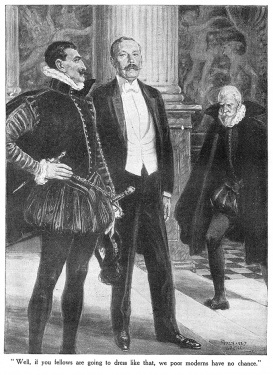 I could recognize the man now if I saw him ruddy-faced, about thirty-five years of age, short crisp black hair, and a black moustache, well-built and vigorous. He was sullen and sinister in his expression. was conscious of someone else approaching with a black Spanish cloak. Then it all disappeared. I was now in a vehicle of some sort; I have no impression of a horse, but I was more conscious than before of my companion. There was a vague feeling of hurry — we had to be at a certain place by a certain time. The road was broad and curving, with a hillside upon the left with some ancient ruins built right into it. At the top of the hill we stopped. A wonderful panorama of a city lay before me. It was built upon low hills, and it undulated away to the horizon. The sky and atmosphere were grey, but not more so than London on a winter day. I have never seen so great a city. High buildings and towers stretched as far as I could see, but I saw no spires. Then all faded away and I awoke. It was a very intense experience, and I give the explanation which I received next day from psychic sources for what the reader may think it is worth. It came in reply to questions: "It was a probationary city. Those pictures were instructive to people in that stage. You did not see your guide because it would have taken from the power. The power was running low, so we had to hurry in the end. You were taken to a grey city because that side of spirit life has always excited your sympathy and curiosity." Such was my most vivid nocturnal experience. Dreaming true is the only psychic power which I have hitherto developed outside healing. Before we went to Australia I got the name "Nalderu" imprinted on my mind in sleep, and wrote it down on waking. We sailed in the Naldera, though we had intended another ship and had never consciously heard of the former. Again, I have put it on record before the event how I dreamed that the Piave would be the turning-point of the War many months before the Italians were driven back sixty miles to that position, where they won their decisive victory. In literature I have had little help from dreams. Once I woke with a line ringing in my head. It was: "She walked alone on the Hills of Fate." I wrote a poem called "Victrix" round it, and it marks my highest point, perhaps, on the foothills of Parnassus. I may conclude these notes by stating my opinion as to the exact nature of dreams, as I have already done in my "New Revelation." There seem to me to be two forms, and only two: one the experiences of the released spirit, and the other the confused action of the lower faculties which remain in the body when the spirit is absent. The former is rare and beautiful, but the memory of it fails us. The latter is common and varied, but usually fantastic or ignoble. By noting what is absent in the lower dreams one can tell what the missing qualities are, and so judge what part of us goes to make up the spirit. Thus in these dreams humour is wanting, since we see things which strike us afterwards as ludicrous, and are not amused. The sense of proportion and of judgment is all gone. In short, the higher is palpably gone, and the lower, the sense of fear, of sensual impression, of self-preservation, is functioning all the more vividly because it is relieved from the higher control.